The description "Irish stew spiced with jalapenos"(No Depression No. 3 Jan/Feb 1998) has been applied to this band, and it seems to fit quite well. This group takes elements of Celtic music, elements of Tex Mex music and elements of virtually every other form of folk music and mixes them into a sound uniquely theirs. The influences from various folk traditions serve to remind us of just how solid of a thread runs through the folk musics of many diverse regions. If you ever get the chance to see The Mollys live, jump at it. Whether you appreciate their particular form of music or not, this is one of the most fun bands you will ever see. They really look like they are seriously enjoying themselves, and that excitement is contagious. The lineup on this album is Catherine Zavala, Nancy McCallion, Kevin Schramm, Gary Makender and Dan Sorenson. The album can be purchased in record stores and directly from the band. 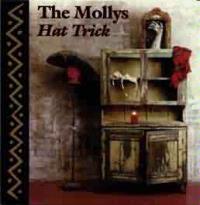 To order from the band, send $17 to The Mollys, PO Box 40940, Tucson, AZ. A handy order form can be found at their website http://www.mollys.com. The intro here is a piece called Jock in London. It is a Celtic acoustic guitar instrumental movement, which is actually a bit reminiscent of both Steve Howe and Jimmy Page, which quickly takes on an even more definite Celtic feel as a delightful flute line takes control for a few bars. Once the song jumps into the vocal section(I Don`t Wanna Go To Bed), it takes on a bit of an Indigo Girls sort of feel, and still contains many elements which are traditionally Celtic. This is a well-done Celtic tinged folk tune. This track is very much a rock and roll song, which contains some solid bluesy/country influences. A fairly gritty tune with a lot of energy, and Say Nothing contains a tasty musical quote from the melody of Jimi Hendrix` Third Stone From the Sun. This is a very fun and catchy track, and features an instrumental break which is heavily in a Tex Mex sort of mode. Definitely a country song, this is still quite fun. In fact "fun" is really the key word when it comes to The Mollys work. This is a well constructed number, firmly in the country music tradition, but certainly creative within that mode. The ending segment to this song is entitled La Filamena and is just your basic country western polka, a very entertaining marriage of musical forms. Starting out on the accordion, this is a slow song, essentially in country mode, and features a tasteful acoustic guitar solo. The intro here is in an almost Spanish sort of style, and is actually quite dramatic. Once the intro has finished, the song becomes a bouncy sort of country rock piece. This is quite a high-energy number, with more of the emphasis on the rock side than the country side. A pleasing acappella section is featured before the song is finished. This is another bouncy, high-energy song. This instrumental is firmly based in solid folk traditions as divergent as klesmer music and Spanish folk song. Hat Trick is one track which readily shows just how many common threads all folk music has. A very dramatic piece, this is one of my favorites on the album. Long is the Dark begins and ends with acapella sections. A slow, song deftly combining Celtic and several other folk traditions, this one is slightly melancholy, but still a bit bouncy and energetic. Again, it is very hard to find a Mollys song that is not a lot of fun. The intro here is an instrumental section featuring the accordion. Once it jumps into the vocal portion of Pride Over Dollars, the song takes on a solidly Spanish sort of texture. This is quite an emotional piece and contains some very quirky changes. You can really picture someone doing a sombrero dance to this tune. There is a very interesting instrumental break here which uses the central theme of the song, this time placed into a polka sort of setting. The final section of this track is a polka based instrumental. During this segment, it is very possible to see the sombrero dancers in the original segment dropping down to do a traditional Russian dance. This piece is clearly my favorite track presented on this disc. Beginning with a slow accordion type movement, eventually acoustic guitar joins the song. Then in come banjo, drums, bass, and ultimately, the vocals. Another song with strong country roots, this is a fun folk oriented song. It is easy to imagine this song being performed in an old west saloon. In fact, there is a break which is alternating sections of melody and percussion that actually reminds me just a tiny bit of the Green Acres theme song. Another bouncy sort of folk-rock piece, the intro to this one actually has an almost progressive rock feel to it`s texturing. This track really does have a very interesting mood to it. The instrumental break to this one provides more of the Russian/klesmer type folk stylings. The progressive rock type mood returns in the final instrumental break of the song. This track is a country-based ballad, which, although not a bad track by any means, seems a bit flat in comparison to the rest of the album. This song really seems like it could have been performed by either The Grateful Dead or The Rolling Stones. Both of those bands have done country-based songs similar to this one. This is a brief, grin inducing little song. The first section of this piece, El Bandito, would certainly be at home performed in a Mexican cantina. This is an entertaining treatment of that particular style of music. The piece is rounded out by a rather intriguing rendition of the standard Orange Blossom Special, in this case the lead being taken by the accordion. This section is performed complete with train whistle. This is a nice banjo-based ballad which conjures pictures of an old prospector out panning for his fortune. In fact, the entire track is simply banjo and vocals. This is a rather low key, but still satisfying way to end the album.